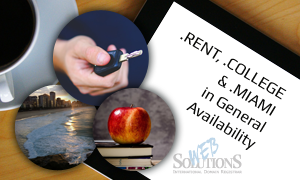 Three more new gTLDs: .RENT, .COLLEGE, and .MIAMI have become available for general registration. It is now easier than ever before to mark your presence on the Internet. With the new generic and geographical extensions, more naming opportunities are available to Internet users who wish to register a meaningful and memorable domain name. .RENT is a perfect option for anyone in the real estate rental business. The domain can be applied to industrial, commercial as well as residential real estate and names can be registered by businesses, groups or individuals, and organisations. The .RENT extension may also be good for any other rental-oriented webpage such as equipment, costume, or car rental. While .COLLEGE is dedicated to educational activities and related services, .MIAMI is likely to join other successful geo TLDs such as .LONDON or .BERLIN. Geographical domains help to emphasise the affiliation with the particular location, its client base, the whole region or its culture. If you wish to check if the name you are looking for is available, please enter the domain name in our search tool. If you need assistance, do not hesitate to contact us at support@web-solutions.eu or via phone on +44 (0) 208 133 3994.